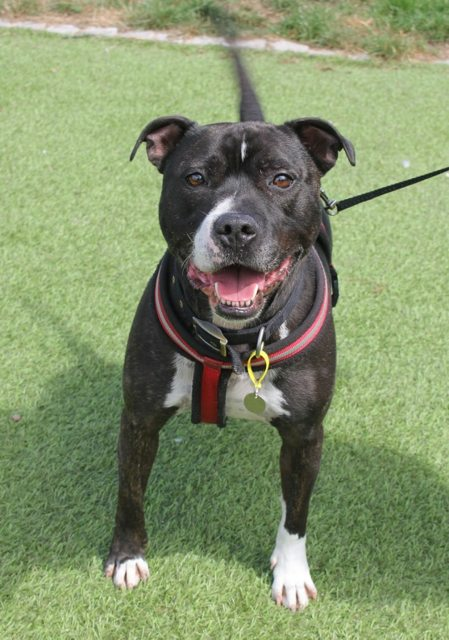 Billy Bob is a 5 year old male Staffordshire Bull Terrier. Billy Bob was rehomed from us back in 2016 but has sadly found himself looking for another home due to the recent addition of a grandchild. Billy Bob has not shown any aggression towards the new baby but his owners feel that they cannot trust him and therefore he is having to be locked in a cage when the baby visits which is unfair on him. Billy Bob is a very sweet and affectionate boy who loves people. He is ball mad and is at his happiest with a ball in his mouth! He is clean and non-destructive in the home and is happy to be left for a few hours so long as he has had a walk beforehand. He also travels well in the car. 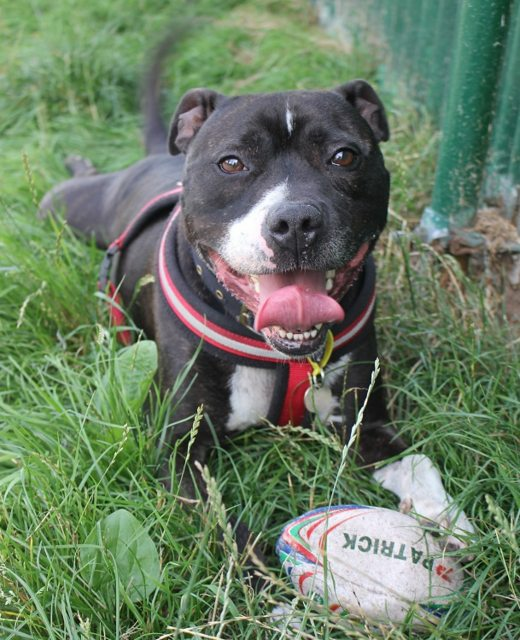 Billy Bob can be reactive towards other dogs and will need to be the only pet in the home. However if he is on a walk and is occupied with his ball he will happily ignore other dogs. He does not like cats and cannot be housed next door to a cat as he can fixate on them. He will need a secure home as he will take himself on an adventure if a door is left open! He has also been known to jump high in the past so his new home must ideally have fencing of at least 6ft. We are looking for a home for Billy Bob where any children are older, sensible children as he is not used to young children. We are desperate to find Billy Bob a second chance at happiness and believe he will make a very faithful friend. PLEASE NOTE THAT BILLY BOB IS NOT CURRENTLY ON SITE AND IS STILL WITH HIS OWNER WHILST AWAITING A SPACE AT THE RESCUE. PLEASE CALL 0151 931 1604 IF YOU WOULD LIKE TO MAKE AN APPOINTMENT TO MEET HIM.